I dare say this film is a master work. Highly recommend. Excellent movie!! A tear jerker at parts and really makes you think about how different events in life affect children. This a good movie for parents and teachers as well as school age kids to enjoy. It is clever and sweet and funny with a good message. Enjoy! Great lessons for kids to learn. Well Pixar did it again, they made another classic. And like any Pixar move there must be a short film before the movie. And this one was called Lava. 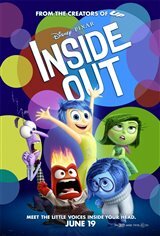 The short film was just great, and then Inside Out started, and it was fantastic. Literally nothing to lose and you walk out of the theatre feeling all warm and fuzzy. Watch it! This movie is amazing, love every minute & when able, will come back for more. Nothing to dislike. Best movie ever.